This exercise strengthens your upper back muscles, which help you bring your arms across your body in the backswing and raise them up in the air. I recommend starting with five pound weights and working your way up after you get the hang of it. Start by laying down on your chest on a bench or medicine ball. Grab the dumbbells, one in each hand. Begin with the V exercise. Extend your arms out in front of you in the shape of a V with your thumbs pointing toward the ceiling. Squeeze your shoulder blades together. Now lower your arms into a W position so that the dumbbells are level with your ears. Lastly, extend your arms out to the sides to form a T, keeping your thumbs pointing toward the ceiling. These 3 movements together are considered 1 rep. Repeat these movements for the number of desired reps. Grab a kettlebell that is about 20-30 pounds and set it down on the ground in front of you. Feel free to increase the weight as you are comfortable. Stand with your legs shoulder width apart. Pick up the kettlebell with your right hand. And hold it down by your side. Lift your right leg off of the ground. Do not lock your left knee. Keeping your back straight, bend at your hips and slowly lower your chest until it is parallel to the floor. Rise back up. This is 1 rep. Repeat the exercise for the desired amount of reps. Switch to standing on the other leg and holding the dumbbell in the other hand after you complete all reps. The SLRDL helps build your glutes and hamstrings which generate all the power in your swing. It also helps you with stability and balance and works your core muscles. 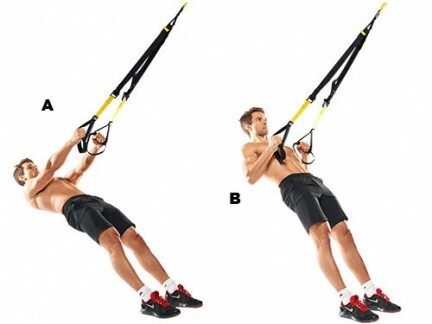 The TRX Low Row strengthens your back, abs, shoulders and biceps, with an emphasis on the back. A strong back is important for the golf swing as it helps you keep the correct posture. Grab the TRX handles with your palms facing one another. Lean all the way back until your weight is on your heels and your arms are extended out in front of you. Apart from your arms, your body should form a diagonal line. Keeping your core tight, squeeze your shoulder blades together as you bend your elbows and pull your chest up to meet your hands. Lower yourself and return to the original position. This is one rep. Repeat the movement for as many reps as desired. Lateral band walks help increase the strength in your gluteus medius muscles which help with hip stability. Stable hips are important because they allow you to get full rotation in your swing. To do this exercise, position a band around your lower legs. Stand in an athletic position with your knees slightly bent, feet shoulder width apart and your head and chest up. Staying low to the ground, take a lateral step. You should feel the resistance and tension in your glutes. Repeat this exercise across the room and back. I hope these exercises for your golf game help you get more out of your swing. Physical fitness is an important part of living a healthy lifestyle, and should be a part of your everyday routine in addition to maintaining a healthy diet. Taking care of your body won’t only benefit your golf swing, it will improve your quality of life as well.